I'm sorry you're going through this with your ex. Definitely get him into a honey jar immediately. Candles do not need to be tapered, any kind will do. Use pink for romantic love, red for passionate love, or while for all-over healing of your relationship. 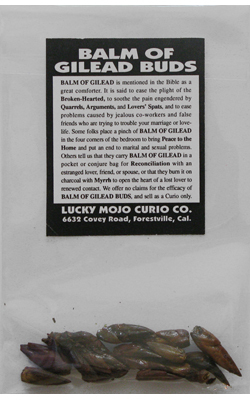 Add some Balm of Gilead to your jar, to smooth over past hurts and encourage him towards reconciliation. The Reconciliation spell kit is a great idea as it contains everything you need plus full instructions. I’ve tried everything, like I did 3 honey jars etc, but he’s not coming back. I guess you guys were right, he’s never coming back. I don’t know what to do anymore… I just wish I could bring him back. This whole thing makes me wanna die. I wish I could find a way to bring him back. Please contact a doctor if you have feelings of depression that can only be treated with a medical professional. In a side note I was in your shoes over an ex a few years back, I finally did the hard work and worked to get over them, let go of the past and heal. Now we are good friends, that ex went through a break up and I help him with it and advise him, funny how the world turns in the end. Please read Psalms 23 as you pray for Gods love to be on you during this hardship! I'm so sorry to see you in such despair. You've been on my mind and I know you're having a difficult time right now. The readings you received on the radio show a few weeks ago all indicated that this is not the right man for you. You will just continue to torment yourself by pursuing him. When you do the volume of work you've done on him and he still won't return, then it's time to accept that God's answer is no, because something better is intended for you. I know it's hard to hear but it's very important to understand. What you've said before is that you wanted him to forgive you and come back. I think the bigger issue here is the forgiveness part (hence the forum name you've chosen). You want to be forgiven. Him returning to you would be a sign of that, which is why you've worked so hard for it to happen. But you're forgetting that the means of forgiveness are in your own hands - you need to come to a place where you can forgive yourself. Only then you will be able to move on with a renewed spirit and belief that you deserve great love, respect and happiness because you deserve all of that. The recommendation of Cut & Clear is a good one, so you can free yourself of the emotional attachment that is keeping you bound in such misery. Please consider that an important first step, as hard as it will be. Use the link that JayDee provided and it will help you to feel better. Then I would work with Tranquility and Healing products for yourself, to calm your heart and help you be more gentle with yourself. The bath salts are a good idea, as are the oils to anoint yourself daily. They will help to lift your spirit and bring you peace. I do hope you will take the advice that Miss cat gave you on the radio and consult a mental health professional, who can help you handle your feelings in a more constructive manner for your serene and greatest good. Please do that if you have not already done so. You can also send a prayer request to the Crystal Silence League, where people all around the world will pray for you. It is a free and wonderful service. I will keep you in my own prayers as well. I really hope you will take the advice from us here and the radio show, as it is offered with love and our highest hopes for your emotional well being. Please take care of yourself. The way to look at this situation is this man is showing you his true colors and what he's really made of. He knows your history with depression yet he won't check in on you to make sure you're OK. That tells you everything you need to know about him. He's not worthy of you. You've built him up in your mind to be something better than he is. Don't let a man you've never even met destroy your self-esteem. You are very lovable, and letting him take that belief from you is wrong. He doesn't deserve your time or your tears. Walk away. I'm glad you have a therapist to talk to. They are hard conversations but they will get easier. Please stick with it, and please use the Tranquility and Healing products I recommended. They will help you feel so much better. Prolonging your suffering by trying "just one more thing" to get him back is self-destructive and I really don't want to see you go down that path. Please work on yourself now. Let him be another woman's problem. I’m going to Jerusalem over Easter and would like advice on how to set my prayers in the holiest city. Do I add herbs and oils to my prayer? Do I add my name and hubby name and cross cross a psalm over it? Do I write our names criss cross and write my wish around in a ring around our names. Come to think of it perhaps I am mixing the two together. I guess m6 thoughts came from praying using psalm prayers and then lead to using name papers. Yes, I’m trying to reconcile with my spouse. Thank you for your speedy response. Have a Great Easter.